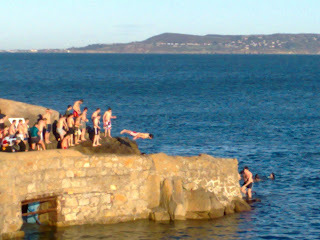 I took this photo on Christmas morning as I joined hundreds of spectators watching dozens of swimmers diving off the 40ft in Dun Laoghaire. Many of the swimmers were there to raise money for charity - and a number of charities were there with their collectors and boxes. It certainly captured the Christmas spirit for me - a reminder that concern for others is one of our most defining characteristics as human beings. Though we can't all aspire to the heights of charitable giving propounded by the great Jewish philosopher Maimonides, the important thing is to start. And for those of you caught in the PAYE/PRSI net don't forget that any donations you make to recognised charities between now and 31st December mean that taxes you would have paid go straight to the charities instead. If, on the other hand, you happen to work for one of the charities, beware the 'crowding out' effect. Recent research shows that once charities receive grant aid directly from government then for every €1,000 they receive from the government private donations fall by €560. This is mainly because charities invest less effort in fund raising, and also because private donors see the state funding and figure their own contributions won't make much difference. I suspect that many of Ireland's third world charities now benefiting from the burgeoning budget of Irish Aid will soon find themselves victims of the crowding out effect if they don't carefully manage the impact of state support. A million miles away from the enthusiasm and joy of Christmas morning swimmers - let's hope it remains that way. Great to hear you enjoy reading my posts. Thanks so much for recommending me to your friends and family!